Car accidents, truck accidents and motorcycle accidents are one of the leading causes of death and serious injuries across the United States. Crashes can happen. They can affect innocent drivers, passengers, pedestrians, bicyclists and others, anywhere in our community. Most causes of car accidents are driver error. Driver error usually results from negligence or recklessness. When driver error happens, drivers can be held liable under civil and criminal law. As injury attorneys, we have become familiar with the common causes of car accidents through our work with hundreds of personal injury cases over many years. Speeding. Exceeding the speed limit or driving too fast for conditions is cited in about one-third of car accidents every year. Speeding drivers may lose control of their vehicles and crash. They may also cause an accident because they have less time to react to unexpected conditions in the road ahead. Speed also increases the force of a collision, and the severity of injuries in a car accident. Distracted driving. Increased use of cellphones and texting while driving have caused a dramatic rise in distracted driving accidents in the last decade. Anything that takes the driver’s eyes and mind away from operating their vehicle – even for a moment – is distracted driving. This includes eating, drinking, grooming, talking to passengers, tuning a radio, reading a map and many other activities. Teenage and young adult drivers engage in distracted driving more often than older drivers, researchers say. Impaired driving. Despite a generation’s worth of tougher laws and public campaigns against drinking and driving, drunk driving remains a leading cause of car accidents across the U.S. Alcohol-impaired driving accounts for about a third traffic fatalities in the country during a typical year, the National Highway Traffic Safety Administration (NHTSA) says. Driving under the influence of illegal drugs, prescription or over-the-counter medications creates a similar hazard. Drowsy driving. Being fatigued or sleepy behind the wheel is another dangerous form of impaired driving. A drowsy driver has slower reflexes and poor perception, and can even fall asleep at the wheel. Students who also hold jobs, night shift workers and those who drive long distances as part of their jobs are more likely than other drivers to be fatigued. Medications can also make drivers too drowsy to drive safely. Aggressive driving. Tailgating, frequent or improper passing and lane changes, running stop signs and red lights, and similar reckless acts are increasingly identified as forms of “aggressive driving.” Many states have adopted specific aggressive driving laws to penalize reckless drivers. Faulty equipment and dangerous roadways. When brakes, tires, steering systems or other automotive systems or parts fail, a driver may lose control and crash. Poorly designed or maintained roads also contribute to car accidents. Product liability lawsuits seek compensation for injured drivers from negligent manufacturers or distributors or automotive parts. Claims may also be brought against government agencies and contractors responsible for road design and maintenance. The experience of the personal injury attorneys at Underwood Law Office is similar to the study of the National Highway Safety Traffic Administration. The driver was estimated to be the critical reason for the crash 94% of the time. The vehicle was estimated to be the critical reason 2% of the time. The environment was estimated to be the critical reason 2% of the time. Driver error, vehicle tires, vehicle brakes, slick roads, glare, and road obstructions top the list for critical reasons for car accidents. Based on this data, the likelihood of causing a car accident increase if you are not well rested, are intoxicated, have tires to be replaced, or driving in the rain. If these conditions are present, drivers and passengers are more likely to experience one of the most common car accident injuries. Every car accident that causes a serious injury or death should be investigated to determine how and why it happened. Police investigate accidents, but only a car accident attorney investigates cause of a car accident with the injured victim’s best interests in mind. It’s also important to remember that the police do not decide civil liability for car accidents. Only a judge and jury can ultimately determine the cause of an auto accident. Determining liability for a car accident can require an attorney’s thorough investigation. We investigate the cause of the auto accident, obtain all the medical bills and records, hire any necessary experts and negotiate with the insurance companies to pursue maximum compensation for your personal injury claim. 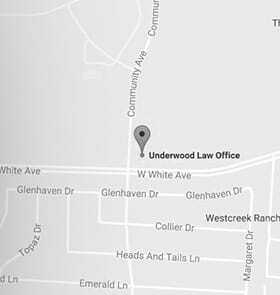 Let a car accident attorney at Underwood Law Office help after your auto accident. We have handled many decades of personal injury cases. Our trial lawyers can help you recover the maximum compensation available in your car accident case.